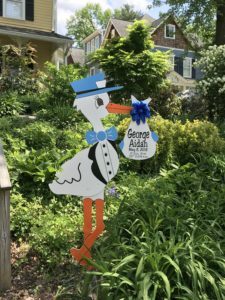 Flying Storks Delivers Lawn Sign Birth Announcements to Welcome Home Mom & baby! If you’re looking for a unique and special gift, you’ve just found it!!! $99 includes, delivery, pick up, and all Stork Bundle Keepsake customization. Washington Metro Areas of Maryland & Northern Virginia and parts of West Virginia too. Including: Adamstown, Aspen Hill, Beallsville, Bethesda, Boyds, Braddock Heights, Brunswick, Boyds, Clarksburg, Catoctin, Damascus, Darnestown, Derwood, Dickerson, Gaithersburg, Germantown, Green Valley, Hagerstown, Ijamsville, Jefferson, Libertytown, Monrovia, Myersville, Middletown, Mt. Airy, North Potomac, North Rockville, Potomac, Point of Rocks, Poolesville, Smithsburg, Thurmont, Urbana, Walkersville, Woodsboro, as well as all of Montgomery and Frederick County, MD. 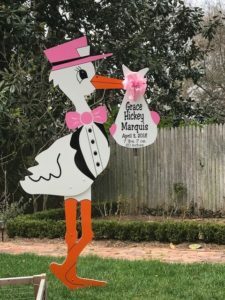 We also Deliver to Harpers Ferry, Ranson & Charlestown, West Virginia, Loudoun County, Virginia, & areas around Leesburg, Lovettsville, Virginia as well!